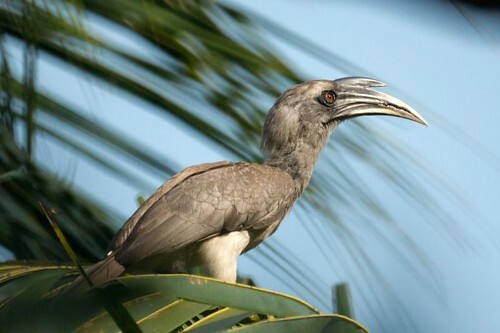 Featured here earlier was the Malabar Grey Hornbill. 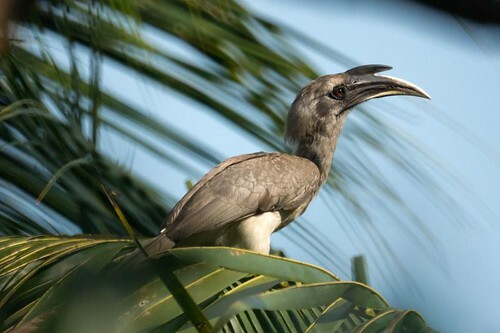 Recently,residing at Srirangapatna while visiting the Ranganathittu bird sanctuary, I sighted a hornbill and assumed from its grey colouring, that it was the same species. 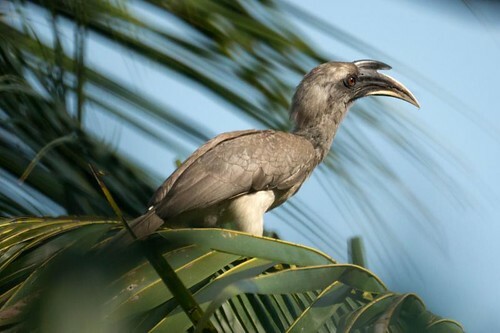 Only on closely examining the photos, did I realise that this was a new species - the Indian Grey Hornbill (Ocyceros birostris). 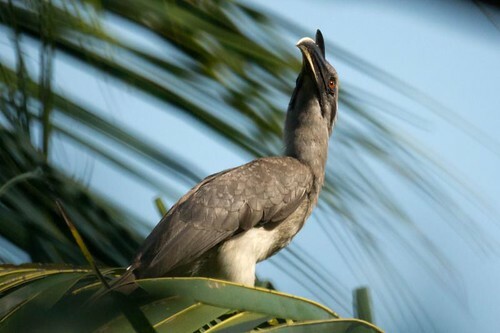 This species is also a common Hornbill. They have grey feathers all over the body with a light grey or dull white belly. 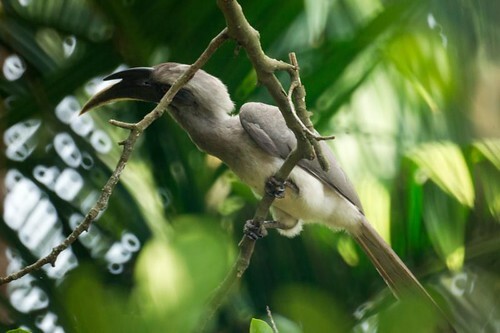 However, unlike the Malabar grey hornbill, this one has black or dark grey with a casque extending up to the point of curvature in the horn. (the former has a yellow beak and no casque). They have a red iris and the eyelids have eyelashes. The casque is short and pointed. The female has a more yellowish bill with black on the basal half and on the casque. 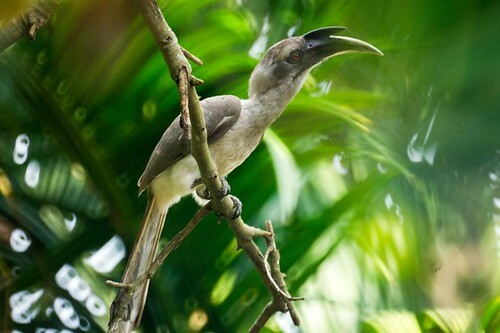 This species of hornbill is generally seen in small parties about open jungle, groves of trees, and gardens, but not in thick forest. 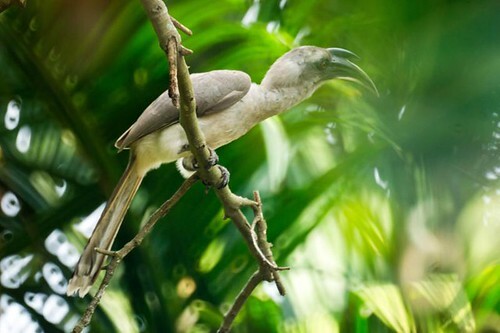 It lives chiefly on fruit, but are also known to take molluscs, scorpions, insects, small birds and reptiles in their diet. These birds nest in tree holes. Existing hollows may be excavated further to suit the bird. The breeding season is from April to June and 3-5 eggs are laid. Once the female enters the nest, it seals the entrance with its own droppings, leaving only a small slit, through which it is fed by the male. The female then moults all her feathers and incubates the eggs. It never leaves the nest from before laying her first egg till the young are about a week old. The regrowth of the feathers in the female coincides with the maturity of the chicks at which point the nest is broken open.